My knitted pooch on Amazon Japan. Whilst it seems that kids today want the fast games, plastic pieces and newest, cutest brand characters, there still a place for the old-fashioned toys. And these include handcrafted cuddlies. I am pleased to say that the days of knitted toys are not gone. I found this delightful knitted dog on Amazon Japan that reminded me of one that my Granny had made me years and years ago. How memorable! My kids still need the soft cuddly toys and ones that have been handcrafted like this are a real treasure. 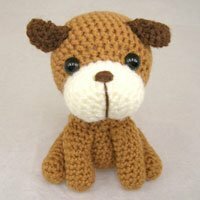 Click here to find out more about how to order a knitted pooch for your family.